State of Grace is a contemporary European restaurant down the business end of Collins st. I’ve wanted to eat there ever since I went to their basement bar Fall from Grace (which, if you can find, is totally worth having a drink or four). After finally booking a table, I went one Thursday night. 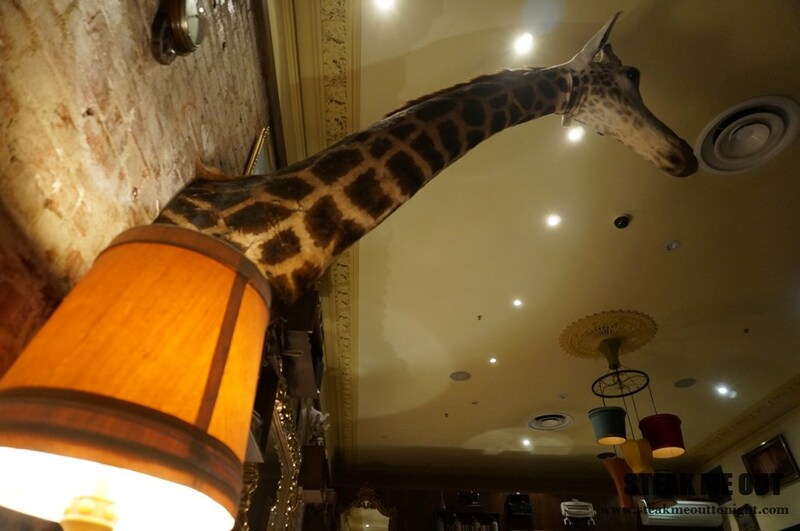 We were seated by the window in the dining room and observed some of the odd décor, old school books, radios and furnishing with a giant giraffes head towering over one point of the room. After perusing the menu, I was drawn to their specials. I try not to order from the specials menu if I plan on blogging about it, but sometimes you just can’t help it. 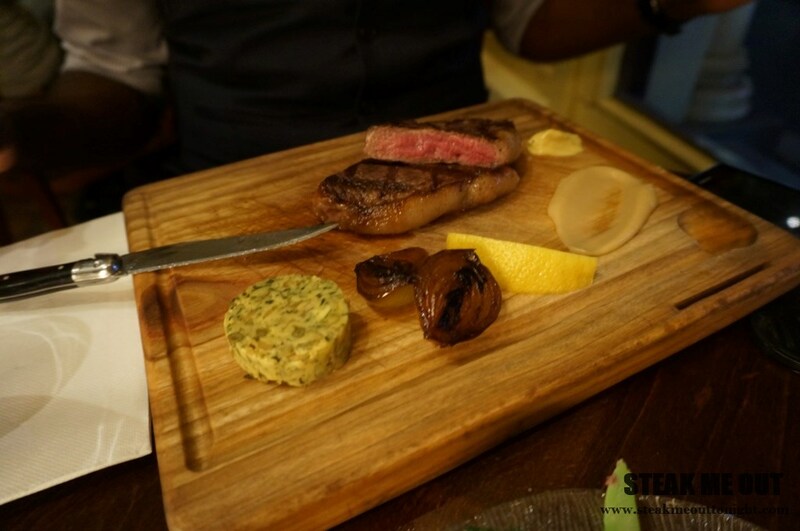 For an entrée, my friend and I decided to share the roast bone marrow, while for mains we ordered the 200g Wagyu Rump Cap 9+ (from the specials menu) and the 300g scotch fillet – both ordered medium rare with a red wine jus and the café de paris butter. We ordered some sides to go with the steak, settling for the potatoes and the broccoli. 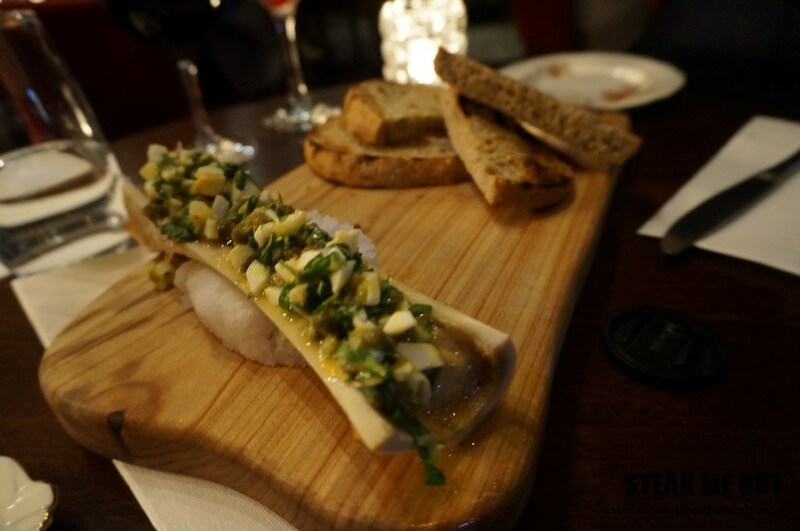 First out the Bone Marrow, and it looked good but was served on salt, which was slightly impractical. One wrong move and a whole mouthful was just ruined. The serving looked big, but was slightly underwhelming. The same can be said about the flavour; most of it being from the gribiche rather than anything from the marrow, it really only had a fatty creamy texture. It was an ok start. We were starving, so the 20 minutes between courses were agonizing. The mains arrived, and I went for the rump first. It looked and smelled fantastic. 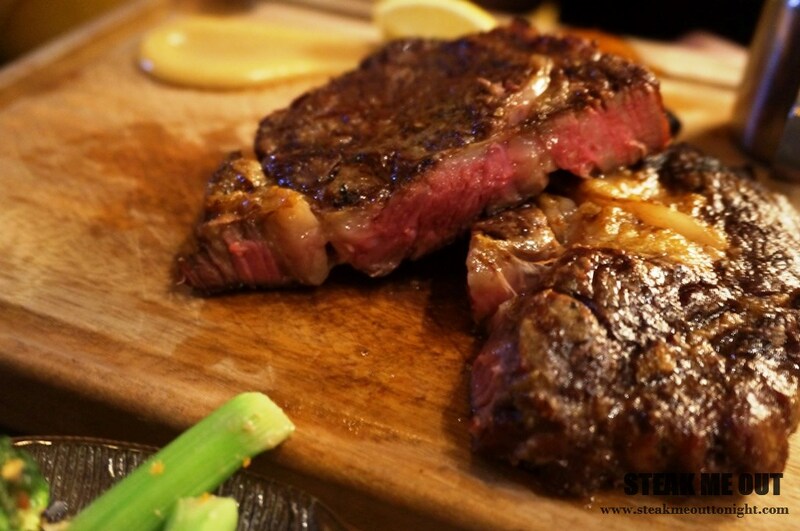 It had a rich creamy texture and a heavy beefy flavour, tell-tale signs of Wagyu. Visible marbling, more rare than medium rare, but it was a delight to eat, tender as a rump cap can be, with the only flaw being under-seasoning. That was fixed when the butter was melted over it. The scotch next, looked just as good and being cooked even better. Taking a bite, it was perfectly seasoned and just as much of a beefy hit. The difference in quality, more specifically the texture, was clear with the scotch being nearly just as tender due to the fact it is a superior cut. It did have more of a grainy feel rather than the creaminess of the Wagyu. 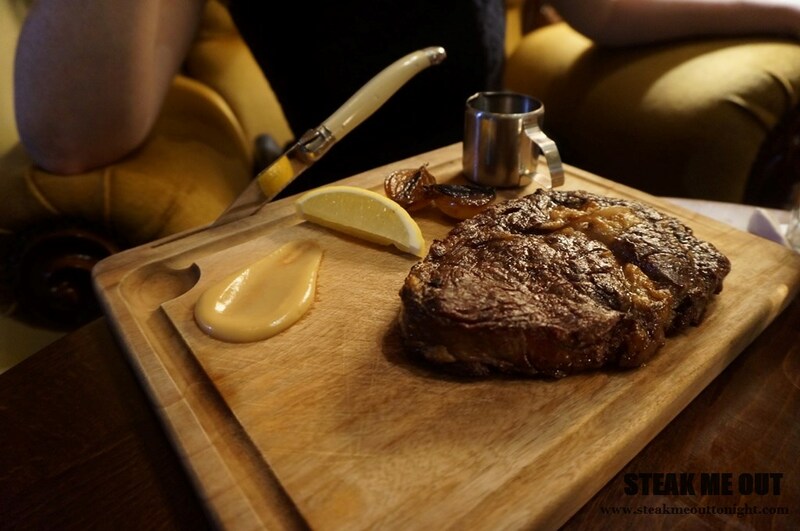 The steaks were served with roasted onion, a garlic puree, a lemon slice and the sauces, all great accompaniments for the meal. 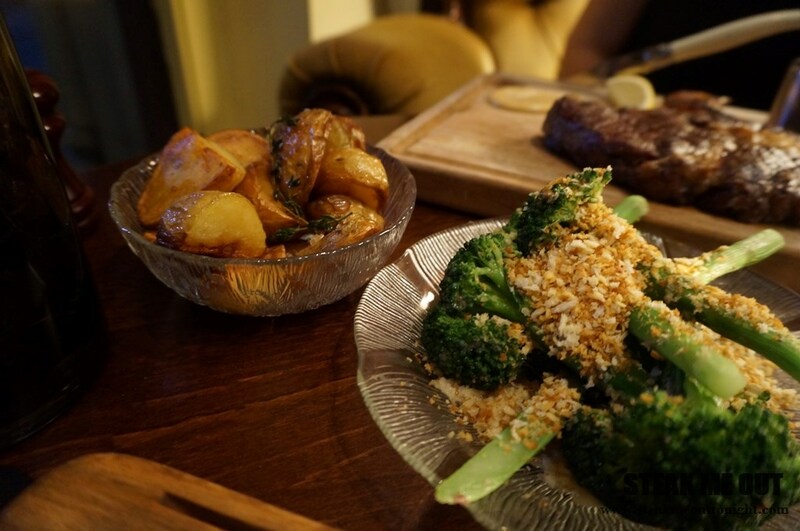 As for the sides, the broccoli was pretty basic stuff, but the potatoes, they were next level: Crunchy, fluffy and delicious. I have a feeling that if the Rump was seasoned like the scotch, it would’ve been near perfect bar the tenderness (which is the drawback of a rump). I love a good Wagyu rump cap, an underrated piece of meat, and it was the one I preferred. I can take nothing away from the scotch though, it was just as good. State of Grace has a nice vibe, great cocktails, and can definitely cook a good steak. I will be going back for another one, with a side of those potatoes. 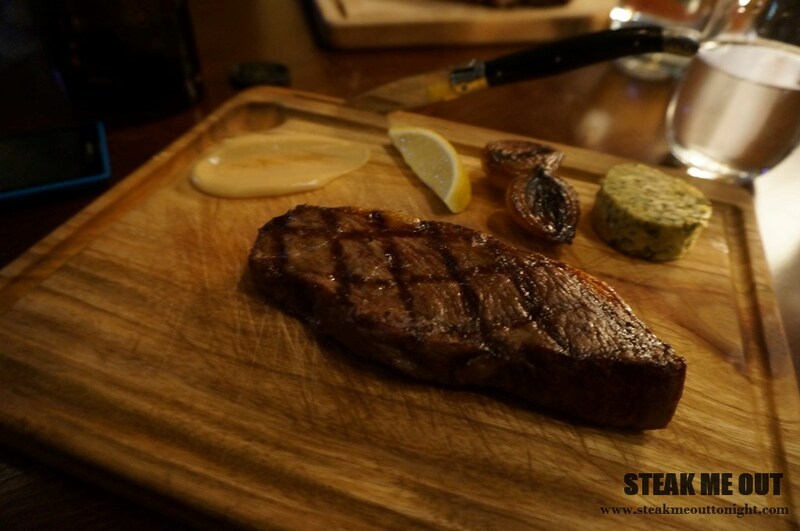 Posted on July 18, 2014 October 13, 2015 by AdrielPosted in Melbourne, SteakTagged Great, Melbourne, Rump, Scotch Fillet, Steaks, Wagyu.